After much uncertainty and speculation we know it officially: Scotland's national stadium will remain Scotland's national stadium. Doesn't sound interesting? Well, perhaps it should. With the current lease on Hampden Park running out in mid-2020, for the last year speculation has been growing over potential relocation of the Scottish national football team to a different stadium after over a century. 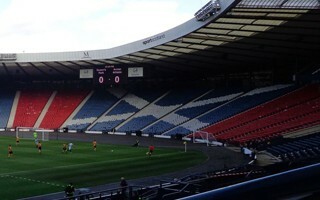 The Scottish FA openly threatened to leave in a move considered by many as a negotiation tactic against Queens Park FC, the historical owner of Hampden, in order to force a sale outright. While serious effort was made by the Scottish Rugby Union to lure SFA to Murrayfield in Edinburgh, that option will remain unused. Queens Park and SFA have agreed terms of sale. After hosting Euro 2020 the venue will officially become owned by the Scottish FA for an amount that may seem surprisingly low: £5 million. Even more, half of that price will be put forward not by the football association, rather by Lord Willie Haughey. All the funds are expected to go into Lesser Hampden, the secondary stadium nearby, which will have to accommodate all activity by Queens Park FC. While the transaction may seem somewhat forced on Queens Park, both sides of the deal were well aware that Hampden already requires investment far beyond what the historical owners could provide. After a very critical supporters survey the stadium is expected to see major improvements in parking, access and other spectators areas, while major reconstruction of the aged bowl is also possible in the long run. Scottish FA Chief Executive Ian Maxwell said: “Today is a big day for Scottish football. Hampden Park has been the spiritual home of Scottish football for over 100 years it has been central to our sport’s identity in this country. But today’s decision is about the future, not the past.